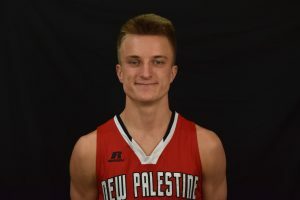 The New Palestine boys basketball team scored the first 11 points of the second half Friday to seize control of a 55-41 victory over 2A No. 6 Shenandoah. The victory gave the Dragons a 2-0 record for the first time in five seasons and their first win over a ranked team since 2014. Matthew True had a hot start – scoring the Dragons’ first 10 points – and finished with 21. Maximus Gizzi added 14 points. NP trailed 19-16 at the half, but scored the first 11 points in the third quarter to go up 27-19, and eventually pushed the edge to 34-23 before a late Shenandoah basket cut the lead to nine going into the final quarter. The Dragons had strong balance in the third, with Dawson Eastes and Gavin Hausz each drilling 3-pointers. Eastes had five of his seven points in the third quarter. Gizzi and True scored four each in the quarter. NP followed with a 21-point fourth quarter, keyed by a 3-pointer by True, who scored seven fourth-quarter points. Gizzi scored six in the final quarter. NP hit 8-of-10 from the line in the final quarter and for the game. Jack Walker and Dylan Romine scored four points each – all coming in the final period. Hausz added three points and Maxen Hook scored two. The Dragon JV won 45-38, led by Eric Roudebush’s 14 points. Jacob Hockett, Kyle King and Justin Rightley scored six each. 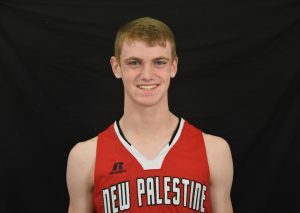 The Dragons are back in action Saturday at Rushville, with a 6 p.m. JV tipoff, followed by the varsity at approximately 7:30 p.m.
Matthew True hit three 3-pointers and scored 21 points at Shenandoah. Maximus Gizzi scored 14 points in the Dragons’ 55-41 victory.